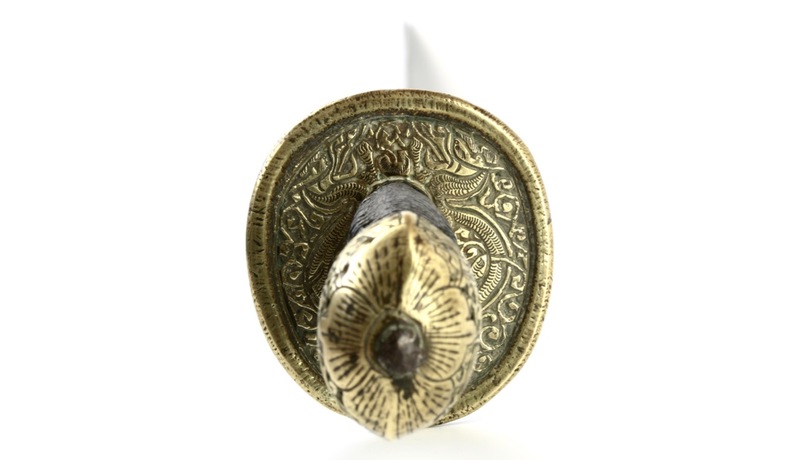 Materials: Iron, steel, brass, wood, cotton, lacquer. 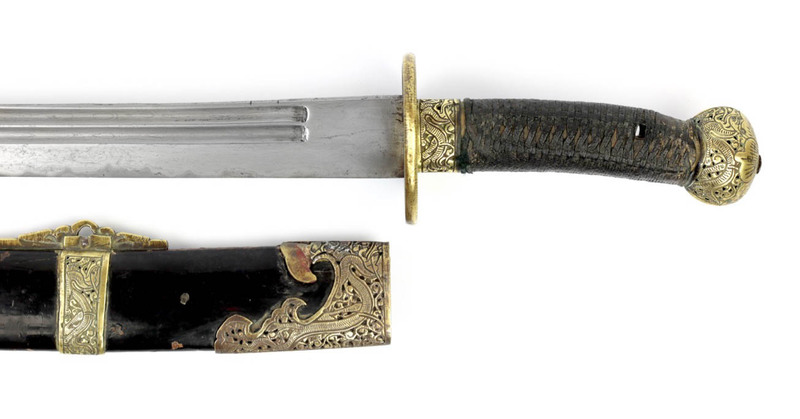 We present a Chinese military saber of the mid 19th century with very good machi (馬齒) or "horse tooth" patterned blade. 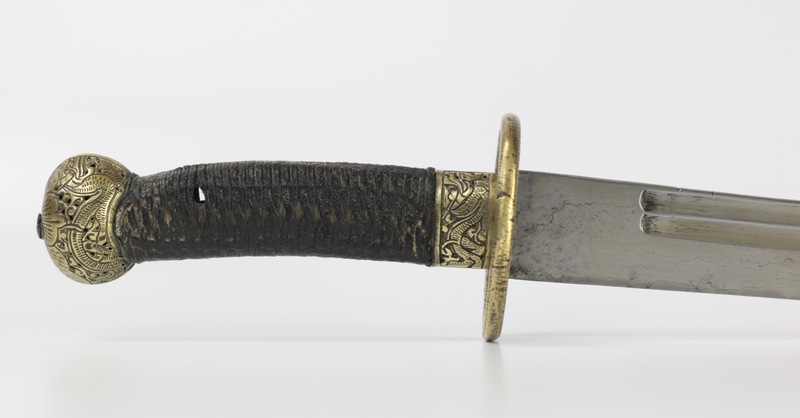 It has a pattern welded blade with inserted high-carbon edge. The name refers to the effect created at the edge, where the line between the layers of folded steel and exposed high carbon plate are serrated. 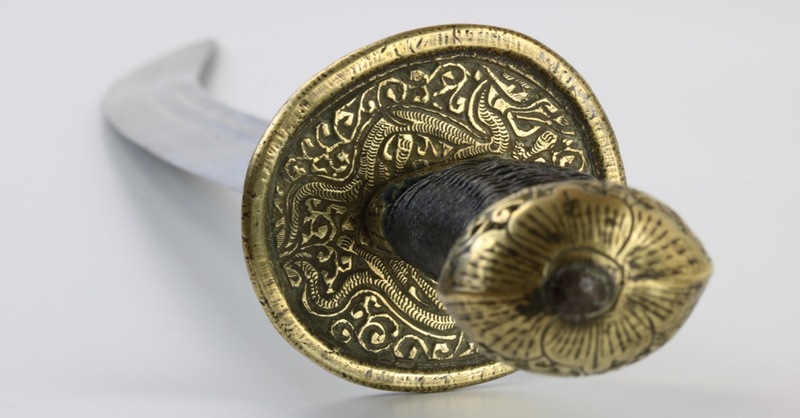 This effect is created by bending the edge section of the nearly finished saber and grinding each side where more of the high spots is taken off, so you look deeper into the blade's structure in these points. 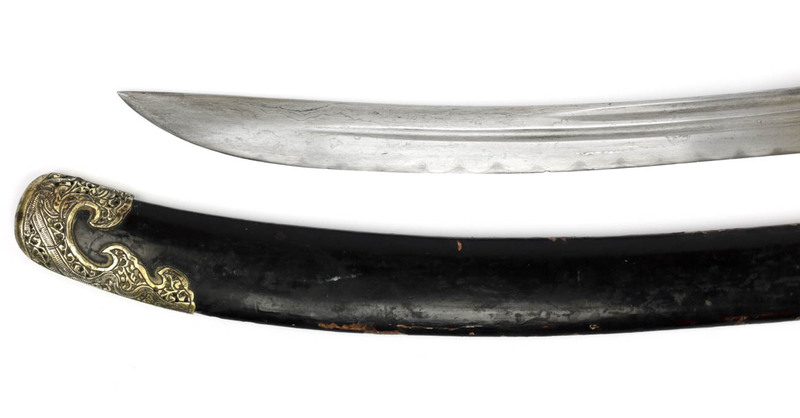 It's a very labor intensive process and among Chinese swords it's even more rare than the highly prized twistcore. The serrations are usually of equal size and interval, but the slightest sharpening will change their look as other layers are exposed to the eye. 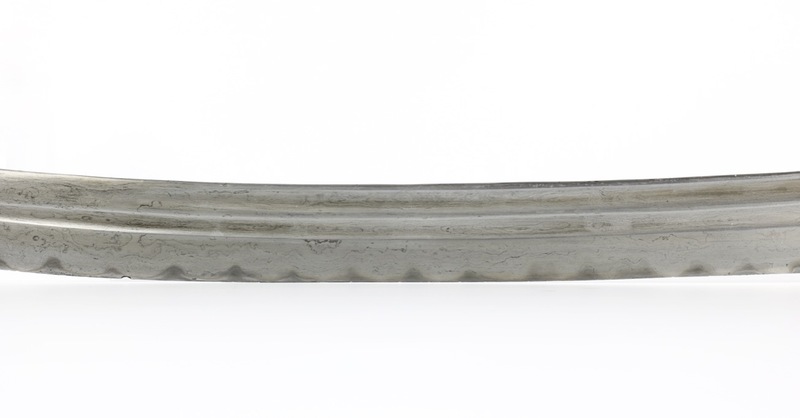 This is why many horse tooth patterned blades come with slightly distorted serrations, especially at the places where the saber is most likely re0sharpened several times. Such effects can also be observed on this blade. 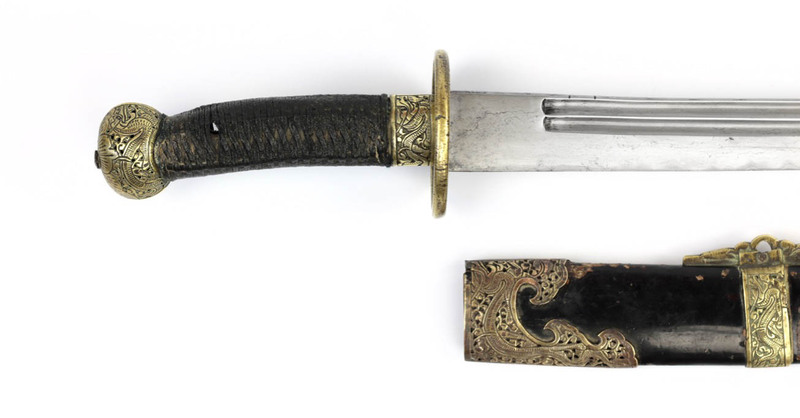 The saber is complete with original handle, original lacquered scabbard, even the grip wrap is original. Handle peening is also intact and original. 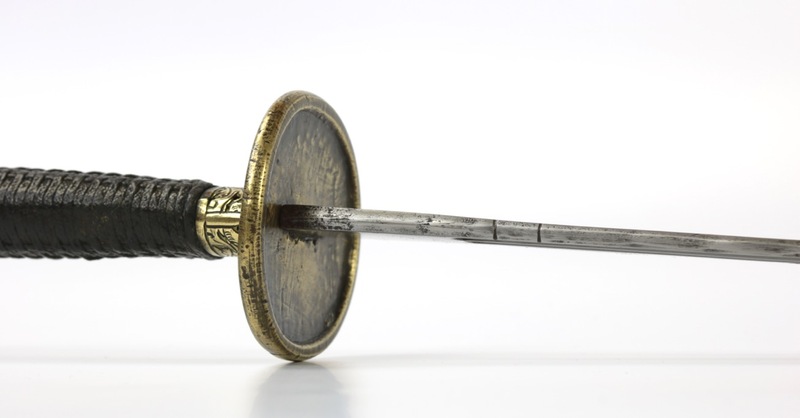 It comes with its original, full set of pierced brass fittings typical for military officer sabers of the mid 19th century. 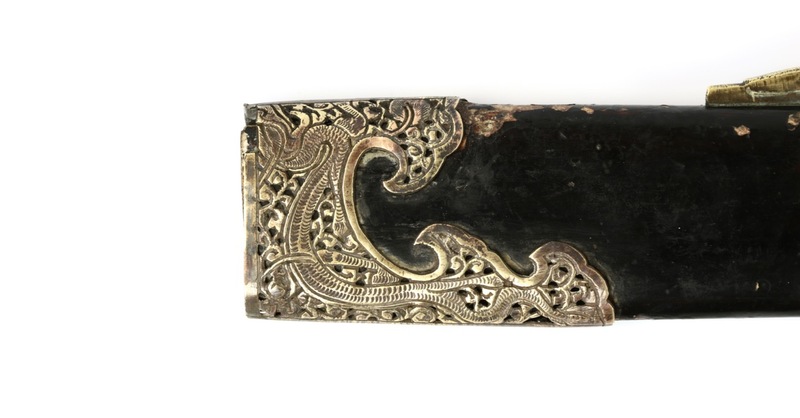 All fittings with dragon and scrolling motifs. 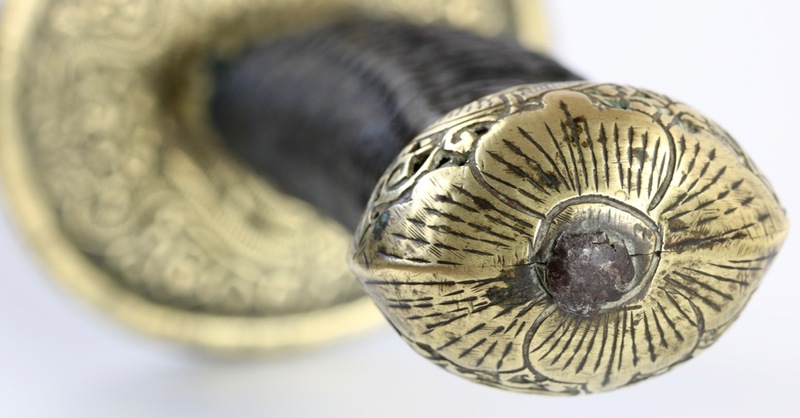 The substantial guard has a chiseled motif of two facing dragons chasing a flaming pearl on the handle side. In nice, all original condition. 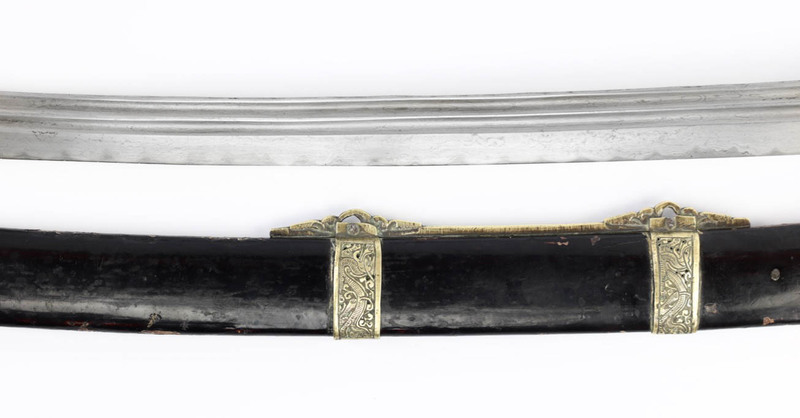 The blade is in very good condition, there are some losses to the other parts: A crack at the scabbard mouth fitting, and some damage to the scabbard end piece. Some losses to the scabbard lacquer, but overall the scabbard is in good shape. Due to shrinkage of the handle the pommel and ferrule are a little loose. The guard is tight. A tiny nick in the blade. No pitting. The grooves are well defined, deep, and run true. The blade has a nice, stiff yet springy temper. 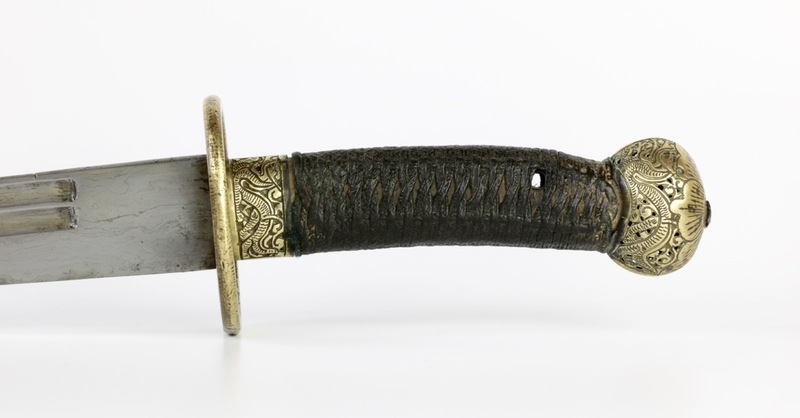 A very good and representative example of a mid 19th century officer saber, retaining all its original parts and with an extremely rare horse-tooth patterned blade.